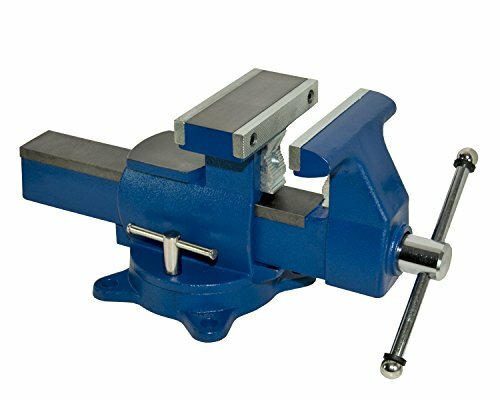 The bench vise is one of the most-useful tools for a shop, but it can be difficult to understand all of the different uses for it. A bench vise is especially useful when you’re working with metal, wood or other materials. The vise locks material in place and allows you to work on it. By preventing the material from moving, the bench vise is able to prevent accidents and increase stability. A common application for the bench vise involves drilling. For example, the vise is used to hold a piece of wood in place while a drilled is used to cut a hole in the wood. Some other common uses for a bench vise are sanding, sawing, metal working and cutting. Since the vise holds and stabilizes material, it makes all of these tasks safer and easier. Below, you’ll find a list of the top 10 best bench vises, so you can choose the model that works best for your needs. The Yost 750-DI is made from stronger material, so it’s about 50 percent heavier than competing products. It’s one of the top products in this category because it’s twice as strong as cast-iron vises. Since it’s a multi-jaw bench vise, you can use it for a wide range of tasks. It has a swivel base and lets you use several different types of jaws. The V-jaws are especially useful for all heavy-duty applications. The vise head can be rotated a full 360 degrees and has 12 different locking positions. The body is made from ductile iron and gives the Yost 750-DI a long, meaningful life. The vise comes with three sets of replaceable hardened steel jaws, which can handle virtually any application imaginable. Its extreme machinist jaws have deep serrations, so they can grip parts much better than competing products. The jaws are made to reduce marring while increasing total clamping pressure. The Yost 750-DI is one of the best bench vises that you can buy. Another top bench vise is the Yost 445. It can be purchased in several different sizes, so you can choose the size that is right for your needs. It’s an excellent bench vise for light-duty applications and features a 180-degree swivel base. You can use the swivel to adjust the direction of the jaws and obtain better placement. The actual vise has a body made of cast iron, and a U-channel made of steel. 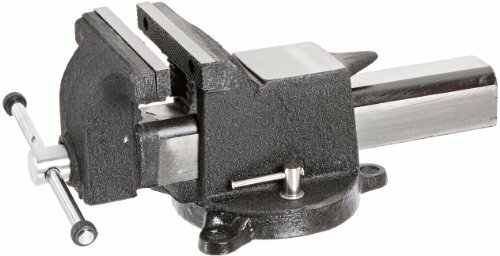 This vise even has a flat portion, which serves as an anvil and provides extra work space. It has replaceable top jaws and grooved pipe jaws. To prevent unwanted sliding, the Yost 445 is equipped with rubber washers. It allows you to secure the position with a hand-tightening lock knob. 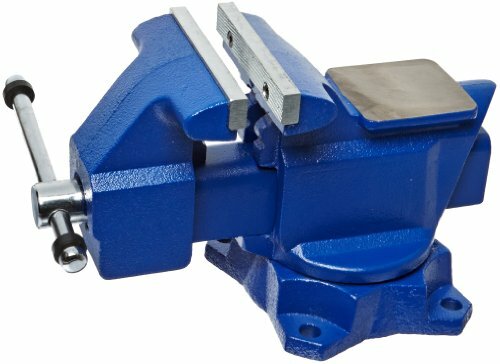 As mentioned earlier, this is an excellent bench vise for light-duty applications, so if you’re planning to work with heavy-duty applications, you’ll want to get a stronger vise. When you consider the other products in this price range, the Grizzly G7062 is a breath of fresh air. It’s a multi-purpose bench vise and has a 360-degree rotating jaw, which makes it much easier to position work pieces. The jaw is capable of holding both round and flat stock. Its built-in pipe jaws are perfect for holding round stock. For optimal versatility, the Grizzly G7062 has base swivels. 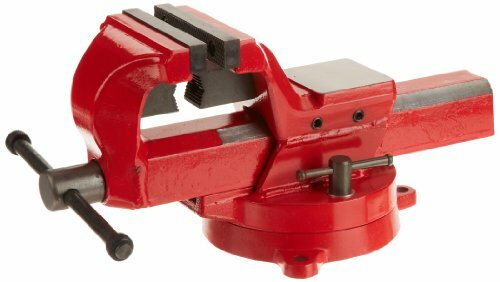 If you’re looking for a multi-purpose bench vise, this could be the perfect product for your needs. With a weight of 50 pounds, it feels solid and prevents unwanted material slippage. In terms of value for the money, the Grizzly G7062 doesn’t fail to deliver. The only downside is the odd shape of the vise, which prevents clamping in certain positions. Overall, this is a well-made, versatile product, and you’ll have trouble finding a better product for the price. Another top product is the Yost 936-AS. This particular vise works exceptionally well for medium-duty applications, so you need to think about what you want to use it for. To deliver optimal versatility, it has a swivel base. The width of the jaw is six inches, so it’s large enough for many applications. A 360-degree swivel can be adjusted and makes proper positioning of materials much easier to manage. The swivel also locks the jaws into place and creates greater stability. The Yost 936-AS has a cast-iron body, so you can trust that it’s durable enough to handle a wide range of tasks. It has an additional flat portion, which is perfect for additional work surface. Depending on what you’re using it for, the flat portion can serve as a reinforced anvil. The top jaws can be replaced have grooves that deliver additional grip. To prevent unwanted damage, the main jaw control screw is covered by a sturdy bar. 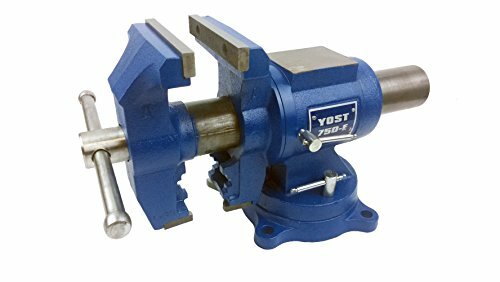 The Yost 936-AS works as a combination pipe and bench vise. Since the whole vise is made from steel, it’s almost guaranteed to last a lifetime. If you’re not afraid to spend more money, you might consider getting the Yost 865-DI. It has a 6.5-inch jaw and swivel base. The jaw provides enough clamping action for light to medium-duty applications. The front jaw is also reversible, so it can be expanded for much larger lengths, which is perfect for applications that involve larger materials. A 360-degree swivel base makes it easier to adjust the jaws, so you get better positioning of your materials. Since it’s made from ductile iron, the body is much more durable than most competing models. Ductile iron will ensure this vise lives a long and meaningful life. Unlike many other bench vises, this model has two flat portions, which can serve as anvils. The top jaws are reversible and replaceable. The jaws also have a serrated surface on one side, so they can deliver an enhanced grip. The pipe jaws also have a serrated surface, so they deliver better grip. You can also replace the jaws if the need arises. 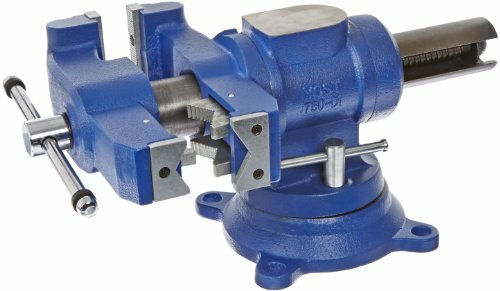 If you’ve been searching for a heavy-duty bench vise, then the Yost FSV-4 could be the perfect model. It features a jaw width of 4 inches, and the vise has a handy swivel. This is one of the best bench vises that you can get for heavy-duty applications. Since it has a 360-degree swivel base, you should have no trouble locking materials into place. The Yost FSV-4 has a body that is made from forged steel, and a powder-coated finish will keep it looking good for years while providing great weather resistance. Like many other bench vises, it has a flat portion for additional work space. A pair of guide rails restores precision and counter wear. The Yost 904-AS can be purchased in different sizes, so you’ll have no trouble purchasing a larger size. This is one of the best bench-mount vises on the market. 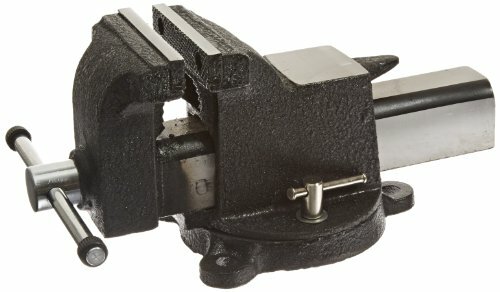 Due to its size, you’ll find this vise to work best for light-duty applications. 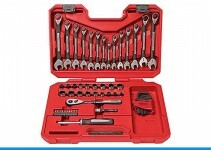 It features a jaw width of four inches, and if the need arises, you always have the option of replacing the jaws. The body is made from cast steel and painted black. The coating of paint helps to protect against corrosion. Some bench vises are nothing more than a pile of fragile castings. Fortunately, the Yost 904-AS doesn’t fit this description because it’s made from cast steel. 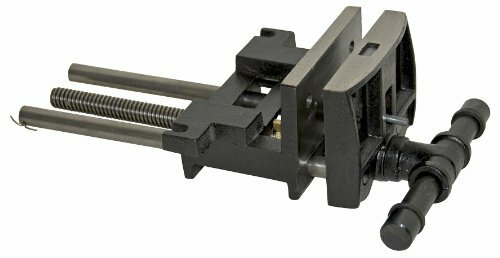 If you’re looking for a smaller bench vise for circuit boards and super light-duty applications, then you might want to consider the Generic Mini Table Vise. It has a tiny jaw opening, so it’s perfect for holding circuit boards while you solder them. The Generic Mini Table Vise is made from polypropylene material, so it’s strong enough to handle a wide range of super light-duty applications. For greater stability, it uses suction base grips. It’s an ideal bench vise for hobbies, crafts and small applications. The Yost 7WW-DI delivers where many other products have failed. 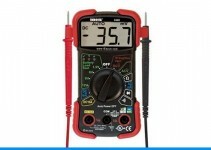 However, it’s quite a bit more expensive than other vises. 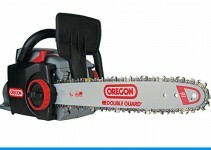 It’s one of the best vises for woodworking and has a 7-inch jaw width. You can mount this model to any bench that is 3 inches thick. It features a body made from ductile iron and should have no trouble handling all of your heavy-duty woodworking applications. Another top option form Yost is the 750-E. It has a 5-inch jaw width and 3-inch pipe capacity. It’s one of the best multi-jaw vises on the market, and it’s designed for home workshops. The vise head rotates 360 degree, which makes it versatile enough to use for many different applications. With a slide lock-down mechanism, it can be used at virtually any angle. It delivers precise, smooth operation, and in terms of value for the money, it’s one of the best rotating bench vises on the market.